"I created this punch recipe when I went looking for a punch recipe for my Baby Shower. I really wanted blue punch because I was having a boy this time. The ice cream melts somewhat and turns the punch a beautiful baby blue color leaving frothy blue and white clouds floating on top. Everyone thought it tasted great and asked for the recipe. Its also very adaptable to your taste. The sky's the limit. Try any flavor or color of unsweetened drink mix in place of the blue." In a large punch bowl, stir together the drink mix, lemon-lime soda, and white cranberry juice. Taste, and stir in sugar to your liking. (I like to add the whole cup.) Float scoops of ice cream on the top. 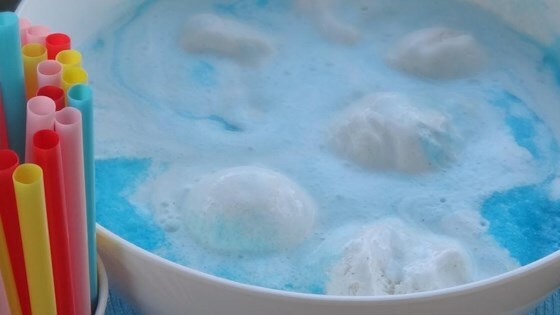 The ice cream melts somewhat and turns the punch a beautiful baby blue color with frothy white clouds floating on the top. I made this punch for my sister's baby shower, she is having a boy. It went over so well, I had to make a second bowl. It was so simple, you can adapt this to be any color you need.